Cristiano Ronaldo has declared his anger at Mesut Ozil’s departure to Arsenal. Germany playmaker Ozil was a deadline-day record signing for the Gunners at £42.5million, with Ronaldo becoming the latest Real Madrid star to express his frustration at the move. According to Spanish paper AS, Ronaldo has told Portugal team-mates his views on Ozil’s switch, which came hours after confirmation of Real’s world-record £86million signing of Tottenham’s Gareth Bale. ‘The sale of Ozil is very bad news for me,’ he said. Real claim the move to Arsenal is a result of Ozil wanting to leave, but he had been told to go because the club need to pay loans taken out to bring in Bale, costing £100m-plus in repayments. Bale will not be able to offer Ozil’s ability to find Ronaldo with a pass anywhere on the pitch, as the Portugal star alluded to. Ronaldo’s words come after a host of other top Real players spoke out on their team-mate’s departure for London. Such was Ozil’s popularity at the Bernabeu, he was one of the few players with friends on both sides of the club’s divide. Ronaldo’s Portuguese contingent were all fond of him, while captain and Spain standard-bearer Sergio Ramos even risked former boss Jose Mourinho’s wrath to stand up for Real’s No 10. In a game against Deportivo last season, when Ozil was taken off at half-time, Ramos put the No 10 shirt on under his own for the second half. He felt Ozil was being unfairly targeted by Mourinho and if he scored was ready to rip off his shirt to dedicate the goal to his friend. 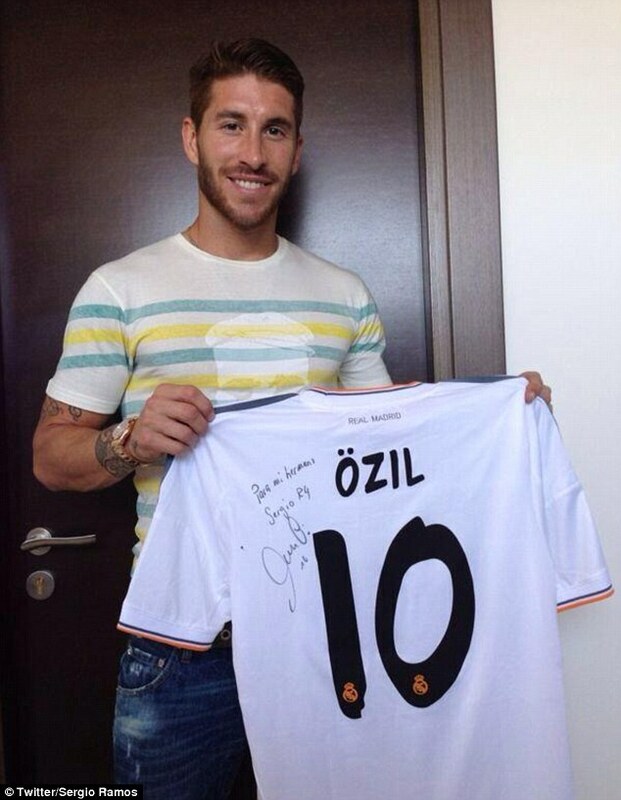 And Ramos said following Ozil’s departure: ‘It’s obvious that he is a special team-mate and friend. ‘I’ve always had a real ‘feeling’ with him, and it’s a shame. He’s a great footballer, unique. ‘Ozil would be the very last player who I would sell from Real Madrid, if it was up to me. I don’t understand this. Ozil’s national coach, German manager Joachim Low, also expressed his surprise at Real getting rid of the playmaker. ‘Many Real players like Sami Khedira or Cristiano Ronaldo are sad about the transfer,’ he said. ‘For me, it’s incomprehensible that Real would sell one of their top scorers. ‘Mesut is a sensitive player and he needs the faith from the club and the coach. ‘It seems that was not longer 100% there at Real whereas Arsenal and their coach Arsene Wenger pulled out all the stops to get him. Madrid playmaker Isco, who joined the club from Malaga this summer, added of Ozil’s sale in Marca: ‘To be honest it has surprised me, and more so after he said last week that he was going to stay. 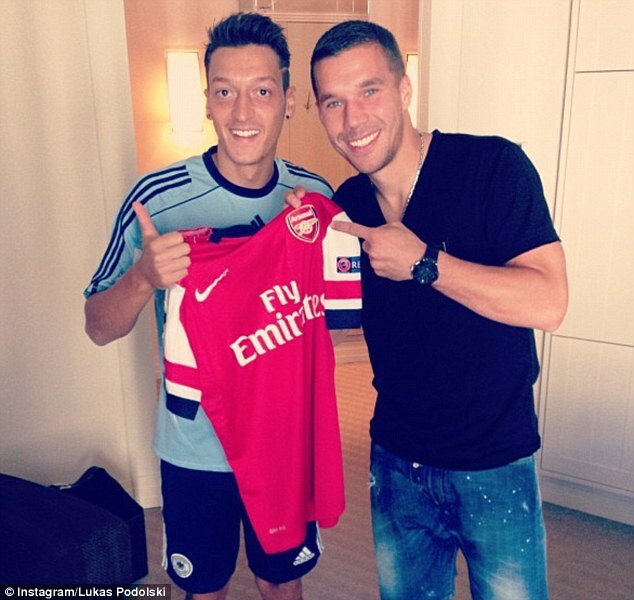 ‘We all know Ozil, he has a lot of quality and he’s a player who is capable of changing a game. Alvaro Arbeloa, who like Madrid team-mates Isco and Ramos is currently on international duty with Spain, echoed the thoughts of his colleagues and admitted Ozil would be missed both on and off the pitch. He said in AS: ‘I’m a little bit surprised, it’s a shame, and it’s a big loss to the dressing room, on a footballing level and on a personal level too. ‘He said goodbye to us on Sunday, but I thought he was joking. He’s very different, there’s no player like him in the world. He makes the difference on the pitch. And there are other voices of dissent. Madrid’s former sporting director, Jorge Valdano, has already said: ‘If they gave me the choice I would put the Ozil-Angel Di Maria pairing before Bale. I would certainly put Ozil before Bale.